I woke up in a little place called Buffalo, Wyoming, at about 5:15 with a phone call from my daughter, Rebekah. Apparently she had forgotten that there was a two-hour time difference. She wanted to see what part of the world I was in now. I told her I was still in bed and that I would call her back in the afternoon. I tried to resume sleeping until 6:00, at which time both Ronald and I gave up, and I jumped into the shower. Ronald likes to shower the night before, so he went out to the lobby and watched the news on TV. It turns out the Internet Service had failed overnight, and so I was unable to email any photos to Rebekah. We were out the door by 7:00 and headed to a breakfast about a couple blocks away. Turned out to be a very lovely breakfast buffet, and we filled up on nice crisp bacon. We were on the road by 8:00. We are now into more mountainous areas, and I noticed that the grass is a bit greener here. It is still mostly prairie, and I noticed some coal trains. In fact, yesterday we passed an open-face coal mining pit. I also noticed a few coal generating stations. There are nice little towns in the valleys along the way, and the railway seems to be a big business around here. Many of the hills have eroded faces on them, and there are little canyons along the way as well. When we exited I-90 and got onto number 14, we started going up and down the mountains. We seem to be going over a mountain pass. It is called the Bighorn Mountains, and we went from 3000 feet up to about 8000 or perhaps 9000 feet. 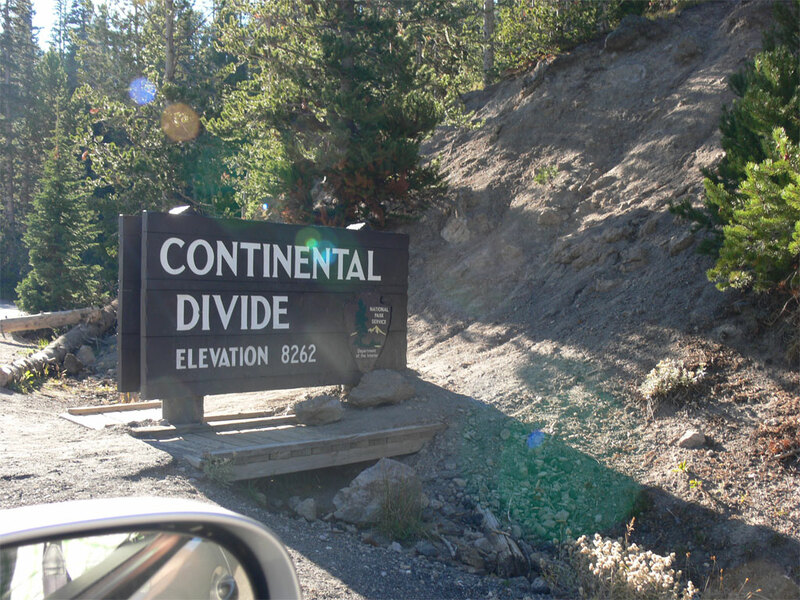 My GPS also shows the elevation we are at, which can be rather interesting. right on the roadway. Apparently the cattle can range freely around here. We are noticing them travelling all over the hillsides and directly on the shoulder of the roads. In fact, as I write this, we’re just passing another bull with a nice set of horns standing right on the shoulder of the highway. I’m not sure I understand how the farmer can keep track of his cattle this way. After a great deal of curves, we reached Cody, Wyoming. We had just above a quarter tank of gas, so I decided we should fuel up as there were not likely that many gas stations in the park. I found a gas station on the GPS, and we pulled in. We’ve been using a MasterCard, so Ronald plugged his credit card into the fuel pump. I decided to look for a washroom, and then discovered that this was an unmanned gas station. There’s not a soul in site! Everything is automated! Rather strange. I then asked directions of a local man to the Wal-Mart, which was our next stop. Ronald picked up a better reading magnifying glass, and we grabbed a bite to eat at the deli. I was impressed at the size of this Wal-Mart. It was the size of a combined Zehrs and Wal-Mart at home. We continued to drive through a huge park on our way to Yellowstone, and ended up going through a couple of tunnels. The scenery on the way to the east entrance seemed to be as impressive as the scenery later found within the park. At the gate of Yellowstone, I purchased an $80.00 National Parks Pass, which will allow us, in this vehicle, to go to any park in North America operated by the federal government. As soon as we got inside the entrance, we discovered that the roadway was down to one lane. We had to wait for 5 minutes until a vehicle in front led through about 3 miles’ worth of roadway before it let us go. I guess this is a glorified flag man. As we got further into the park, we noticed that several areas have been destroyed by forest fires. Most of them were just bare ground with dead poles sticking up. We stopped to take a few pictures. Other areas have new growth, with the young trees now about one-third the height of the originals. The huge forest fires of 1988 did a lot of damage. Our first stop was the visitor’s office, which took almost an hour to reach from the outskirts of the park. I am continually amazed by the size of this park. It’s about half the size of some other states. The visitor’s office was not that impressive, and appeared to be about 100 years old. By “not impressive,” I mean that there were lots of girls at the counters with times and information, but only one ranger who was nonetheless not very helpful. I waited in line and was discouraged to hear the person in front of me leave without making a hotel booking. I spoke to the ranger, who gave me a list of all hotels on the outside of the park. He said that there was nothing available within the park’s boundaries, but that I should check at the main lodge a mile down the road. On the way out, I noticed that the American flag was at half-mast to commemorate 9-11. I was also able to speak to a highway coach driver. 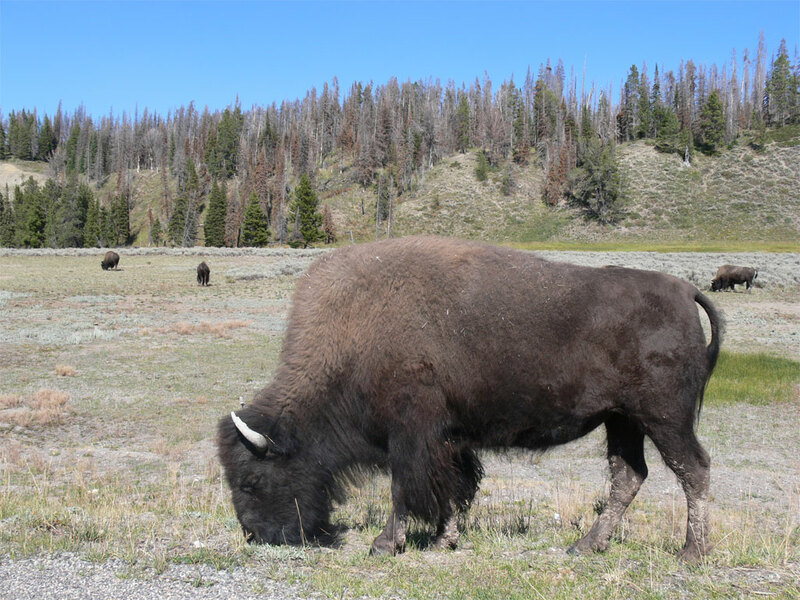 He told me he preferred the canyon area of Yellowstone with a 300- foot waterfall rather than Old Faithful. Ronald still intended to visit Old Faithful. I marked the canyon area down for tomorrow. it. I’d been getting rather concerned, but now our problem was solved, and we could carry on with our sightseeing. 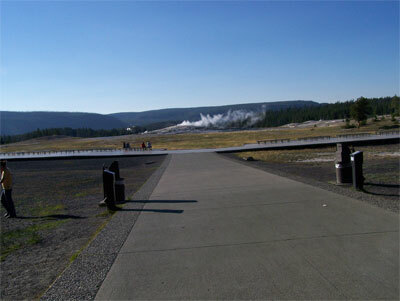 Our first stop was Old Faithful. As it turned out, it wasn’t that faithful after all. The first eruption that we saw was 60 minutes after the prior one. We ended up staying for the next eruption, which was 105 minutes later. When the GPS guided us into the parking lot, we walked to the board walk where there was a smoking mound of rock. Everywhere you looked, there were little puffs of smoke coming out. To the left of the main hall was a smaller old mound with a very small wisp of steam coming out. 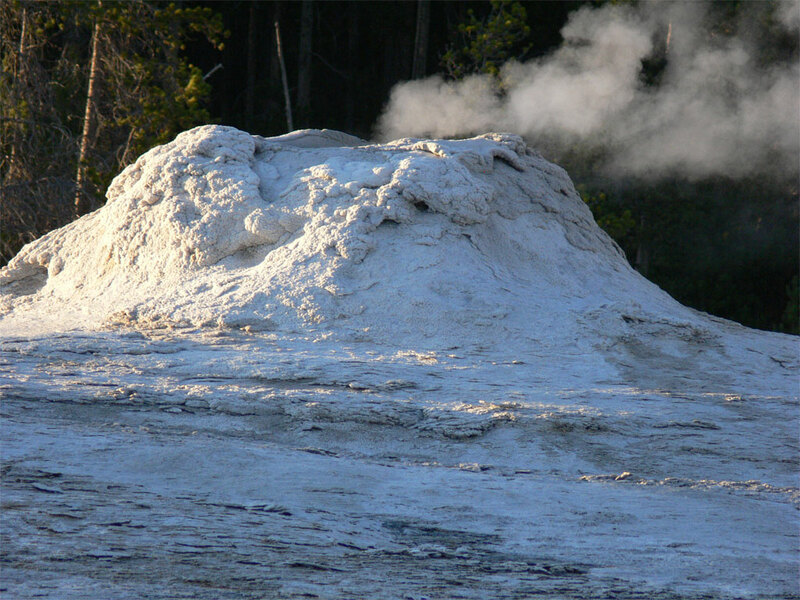 We asked around, and one person said the eruptions happened every 60 minutes. The next person said every 90 minutes. But one lady confirmed that the previous eruption happened at 5:15, and it was now 5:30. So we took a gamble and went into the cafeteria and got our supper. We chose Bison meatloaf. It seemed to be rather lean meat but very good. We got outside again at about 6:15 and we saw one fellow running, saying, “It’s gonna go!” We sat down along with about 300 other people in a huge semicircle on a large board walk made of plastic planks. I set my camera to video. I saw big splash of water come out, and started the video, but then there was nothing. I stopped the video. And then it started to spew out again, and I turned the video on. It was about 10 minutes after we had initially sat down. All of a sudden, it started to shoot 100 feet into the air. For about one minute, there was lots of steam and huge gushes of water, reaching heights between 50 and 100 feet. Then the fountains started to slow down, but continued for the next three minutes. Thousands of gallons must have poured out. 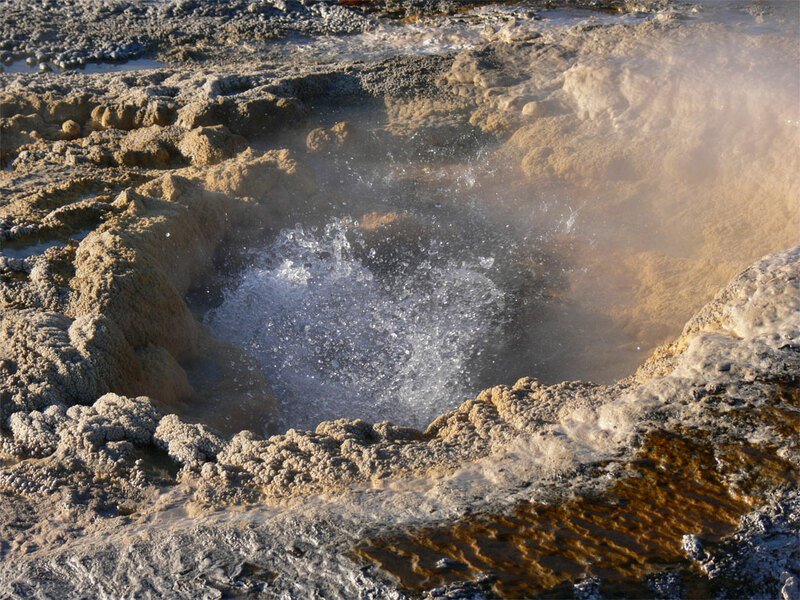 You could hear the rush of steam and the splash of water, and it was all very impressive. I managed to capture it all on video. I hope it turns out. Next we looked for a trail guide, and headed on down the board walk. 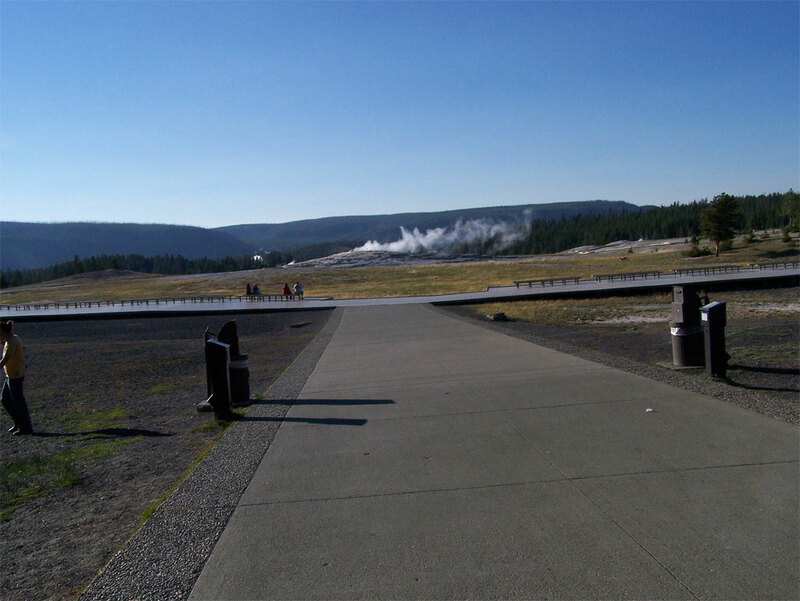 By this time, it was about 6:30, and we wanted to be going around 7:30, so we took the circular path in behind Old Faithful. I was amazed to see dozens of little holes spouting bubbles and steam. 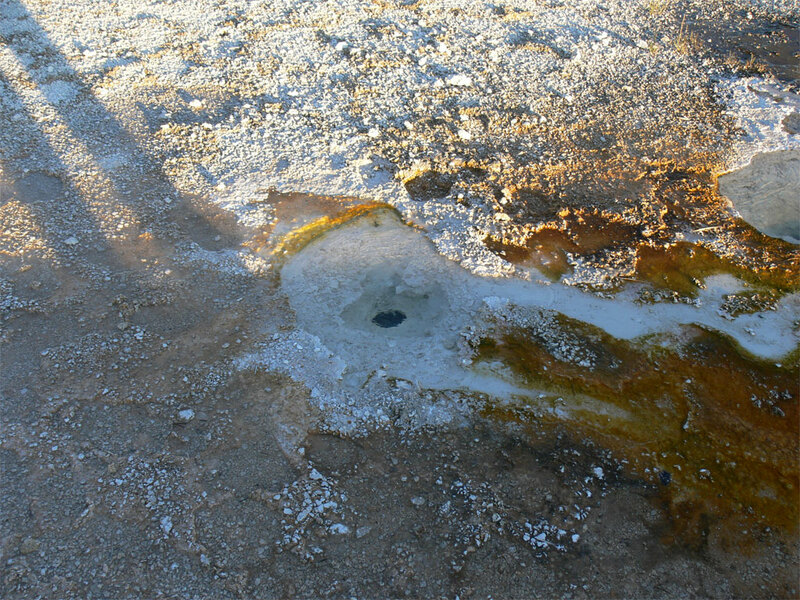 We didn’t see any other geysers while we were there, but apparently some of them periodically shoot forth water. 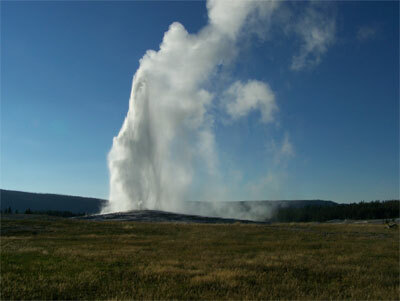 From what the park Rangers said, there are 200 active geysers within the park, with 200 more being sporadic. 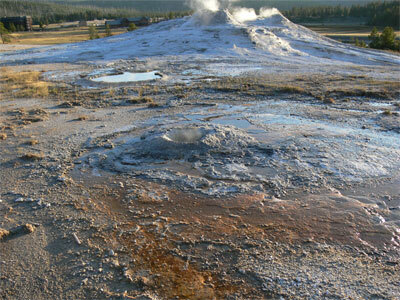 Overall, there are 2000 some odd different sites where water comes to the surface. 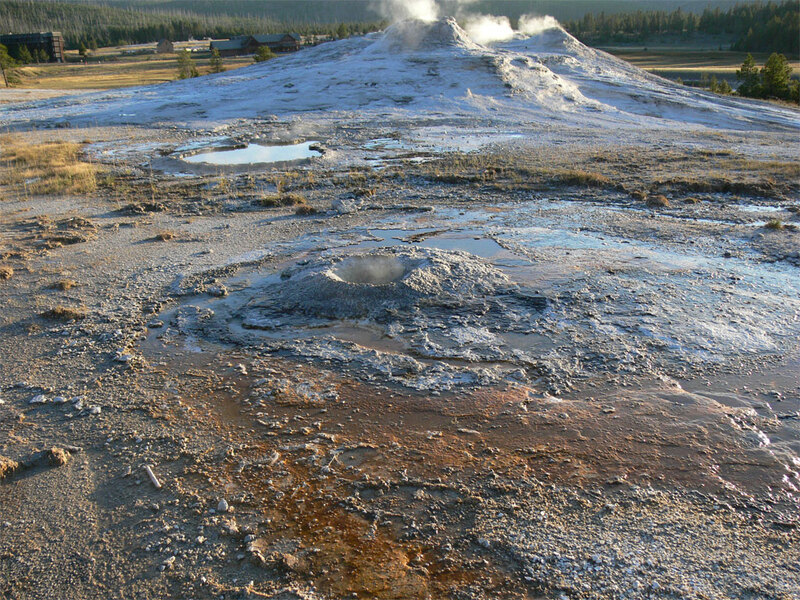 Apparently Yellowstone has two-thirds of all the world’s geysers. It is amazing to see boiling water bubbling out of the ground right next to the board walk. And yet I saw buffalo chips in amongst this scalded looking area. After taking close to 100 pictures, we headed back to the car. Just as we were about to leave, I looked at my watch and realized it was exactly 90 minutes since the previous erection, so Ronald and I headed back to see it a second time. There had been a ranger giving a lecture, and at the 90-minute mark, he stopped. I got my camera ready, and told a table next to me that it should arrive in a minute. I took a couple pictures, and even set up my miniature tripod. Twenty minutes, a few belches occurred, but nothing more. It was now after 8:00, and nearly dark. Finally I decided that it was time to give up, and we turned around to leave. And, of course, that’s when it happened. The eruption seemed to be more impressive than the one earlier on. Perhaps it had built up more pressure. I took several shots, but since it was so dark, they turned out a bit fuzzy. We headed back northwest in the park towards the western entrance where we had our lodging booked, and arrived around 9:00. The GPS tracker led us right to our destination, and I must say I’m getting addicted to GPS travel. Our room was actually two rooms, with three beds, and we both decided to turn in early. However, I first reviewed my pictures. Ronald did seem a little bit tired. Tomorrow we go back to see the Grand Canyon of Yellowstone Park.